Spinballs is a color matching game involving the spinning of a plate of 6 colored balls. You spin the plates that are laid out by creating long chains of colors. You can attempt to spin and plan colors so that the chains eventually explode into power-up nodes that give you special powerups like time stop, nuclear explosions, and multipliers. Spinballs is released by Christian Gross on the iPhone, iPod touch, and iPad for $1.99 and is available for free in a Lite version. Spinballs is a fun, solid puzzle game. The gameplay is simple. Each disk has a left and right side that you tap to spin the plate and it rotates these colored balls. When you get 3 or more color matches, the matched items explode and your time limit increases. You can link colors into powerup areas too to not only fill up time, but fill up powerups. The balls that explode also change the colors on each plate. What does this all mean? It means it’s a frantic mashing of the detonate button, random disk spinning, and what essentially equates to a game that can theoretically last forever. When the AppStore description says “Endless hours of fun” they sure weren’t kidding. This is a very colorful and incredibly bright game with a very nice art direction. The backgrounds are shining and well done, the interface is nice, the sounds and music are both pretty good, and when you level up, a strange head-shaped, angel-winged… thing appears. It’s going to haunt my nightmares *shivers*. In a nutshell, this is a great looking game with all the effort shining through. I really enjoyed it greatly. 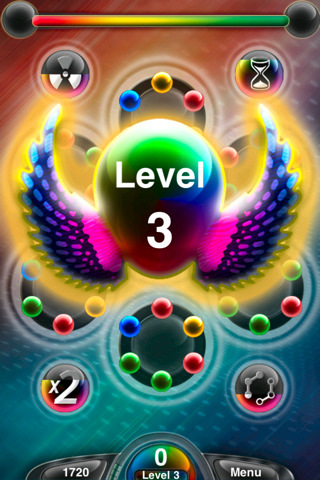 You gain levels for the amount of points you can gather and at higher levels… time runs out faster? I don’t know what happens during the first 4 or 5 levels because I’m just mashing the detonate button and letting the random re-spawning of the balls to explode all by themselves. Do you remember playing a game like bejeweled and scoring a never ending chain of explodable combinations automatically? Probably not. It’s not a critical flaw of course, but it changes the game from a fast paced frantic disk turner into a single button rapid-mashing, waiting until you level up, and every once in a while the activation of powerups or spinning a few disks to get some more explosions. Despite the endless mashing… or maybe because of it, do you want to know how long I played this game? 3 hours. Oh yeah. I’m not kidding. I spent 3 hours just playing through. I died 4 times total in that time. It was really fun to gather powerup points and activate them whenever I was stuck. It was really fun to fill up the time meter and watch the pretty colors exploding. I had a lot of fun with this one and it was a really entertaining, addictive experience. Spinballs was a surprisingly entertaining and colorful game. Its AppStore self-description of “Unique and highly addictive gameplay,” “Brilliant graphics and visual effects,” “Great music and sound effects,” and “Endless hours of fun” are all highly accurate. 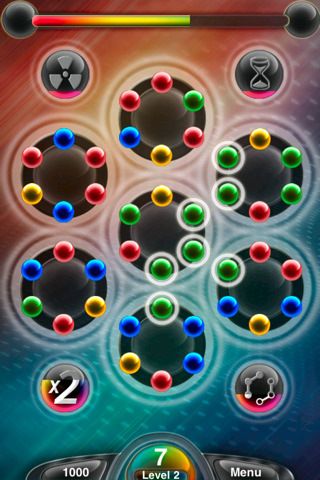 If you are into match-3 puzzle games, try this one out with the Lite version. It’s definitely worth the try. AppSafari review of Spinballs was written by Joseph Ho on October 11th, 2010 and categorized under App Store, Fun, Games, Puzzler, Time Management. Page viewed 3061 times, 1 so far today. Need help on using these apps? Please read the Help Page.